presence of fine grained pelagic limestones (chalks) over the whole of Britain, and much of western Europe. Marginal, non-chalk facies are thus limited to south-west England, Northern Ireland and Scotland, and are predominantly of Cenomanian age. Elsewhere in northern Europe, these non-chalk facies occur in areas such as Normandy, Sarthe and Touraine in France, Belgium, Germany, Czechoslovakia and Poland, each associated with the flanks of emergent massif areas. The faunas of these marginal facies commonly resemble those of the sandy Albian facies already described. By contrast, chalks are a distinctive lithology and show many faunal peculiarities. They may be characterized as friable micrites or fine grained limestones, composed predominantly of the remains of whole and fragmentary haplophycean algae, coccoli-thorphorids. Coccoliths were more diverse and abundant in the Upper Cretaceous than at any other time, and because of geographical and environmental factors as yet not well understood, became sediment producers in the shelf seas of Europe and North America, although they had previously contributed chiefly to deep sea oozes, which they continued to do after this period. 1 A fine clay fraction, which may form an appreciable part of the sediment at levels such as that of the Chalk Marl or Plenus Marl, but generally amounts to only a few per cent or less of the sediment. 2 A coarse terrigenous fraction, predominantly detrital quartz and heavy minerals. This generally forms less than one per cent of the sediment. 3 Minerals such as pelletal glauconite and phosphate, which formed on the sea floor. These occur as minor constituents throughout the whole of the chalk and are relatively common in winnowed and condensed horizons. They are essential constituents of some facies. 4 A coarse calcite skeletal fraction consisting of Oligostegina (calcispheres) planktonic and benthic Foraminiferida, debris of echinoderms, articulate brachiopods, bryozoans, serpulid poly-chaetes, ahermatypic corals and pteriomorph bivalves, notably inoceramid prisms. 5 Skeletal material, which was originally siliceous, such as sponge spicules and probably also radiolarians and diatoms. The silica has usually dissolved, its place being taken by calcite, but it may have been the source of some or all of the silica in the flints which are so common in much of the sequence. 6 Skeletal aragonite. This has now disappeared as a result of dissolution, but evidence of its former presence is given by the casts and moulds of originally aragonitic organisms. These chalks accumulated in an outer shelf environment in a tectonically stable region (see reviews by Hakansson et al. 1974; Kennedy and Garrison, 1975). Depths were chiefly around 300m, but could at times have been as little as 50m. Water temperatures based on deductions from oxygen isotope ratios ranged from 13.5 — 28.5° C, and salinities appear to have been normal. Bottom conditions were very variable. The structural adaptations of some groups and sedimentological criteria suggest soft, thixotropic, pelletal sea bottoms in some places (Kennedy and Garrison, 1975), but firmer although still fairly soft bottoms in others. There is much evidence of early lithification leading to the growth of calcareous nodules below the sediment-water interface. These in turn were reworked into conglomerates, which produced hard substrates and also semi-continuous lithified layers; when exposed, the latter formed hardgrounds which frequently became glauconitized and phosphatized. Depositional and diagenetic processes show cyclical variations, and much of the European Chalk is rhythmically bedded with soft and nodular chalks, soft chalks and hard-grounds or sharply defined burrowed firmer bottoms following one another regularly up the sequence. The seven examples illustrated in the succeeding pages show many of the typical elements of chalk faunas. They are, however, drawn from particularly fossiliferous horizons and localities. Much of the chalk, particularly in the higher parts of the sequence, is very barren of macrofossils, presumably because of unfavourable fluid substrate conditions. 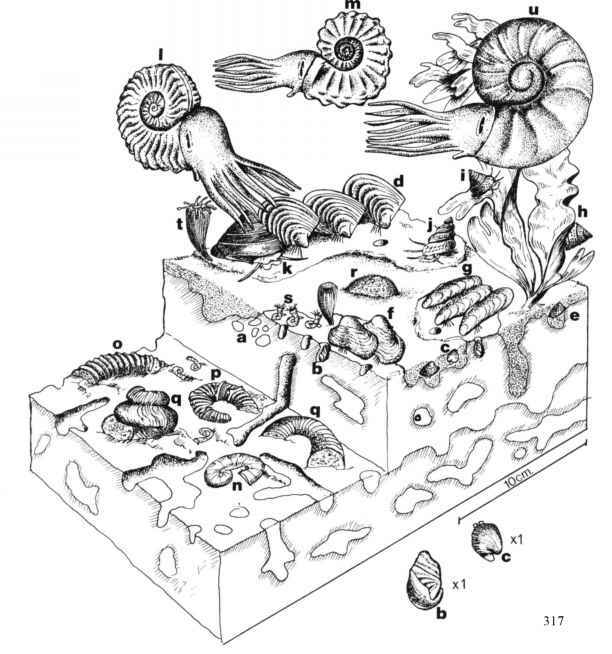 Sample groups of those faunas which do occur, are commonly biased in favour of the more durable fossils since there is strong evidence that originally aragonitic shells of organisms such as ammonites, nautiloids, many gastropods and bivalves were dissolved prior to burial. The curious composition of many chalk faunas which are dominated by originally calcitic organisms, such as pteriomorph bivalves, brachiopods and echino-derms is thus the result of diagenesis rather than being an accurate reflection of the original community. A further problem involves the nature of chalk floras: were there seaweeds, both thallophytes and marine angiosperms, or not? (See Hakansson et al. 1974, Nestler, 1965, Steinich, 1967, Surlyk, 1972 and Surlyk and Birk-elund, 1976 for discussions of these, and other ecological problems of chalk faunas). This illustration is based on the sandy fauna of the early Cenoman-ian at Wilmington in south Devon; there are many obvious similarities to the fauna of the Albian sands described in Figs. 98—100. The whole sequence is bioturbated with spectacular decaped burrows (Thalassinoides); whilst other organisms responsible for the disturbance of sedimentary lamination are infaunal and semi-infaunal irregular echinoids. Those shown here are Holaster laevis, Holaster altus, and Conulus castanea. Many other echinoids are common in these sands. The benthos includes coiled oysters such as Exogyra, the bowl-shaped pectinid Neithea, the byssate Chlamys, and two other organisms showing a similar development of ribbing and plicate margins to counter the clogging of their feeding mechanisms by coarse debris — namely the oyster Lopha and the rhynchonellid brachiopod Cyclothyris. The other examples of benthic fauna shown are the ramose bryozoan Ceriopora, encrusting oysters (Pycnodonte) and inoceramid bivalves. The nekton shown are all ammonites, and these include heteromorphs: the costate Turrilites scheuchzerianus and the tuberculate and spinose Hypoturrilites gravesianus. Of the normally coiled forms, Hypho-plites, with sickle-shaped ribs and sulcate venter, is a descendant of the Albian sulcate hoplitids, whilst the ribbed, tuberculate and keeled Schloenbachia is descended from hoplitids with a flat or slightly elevated venter. 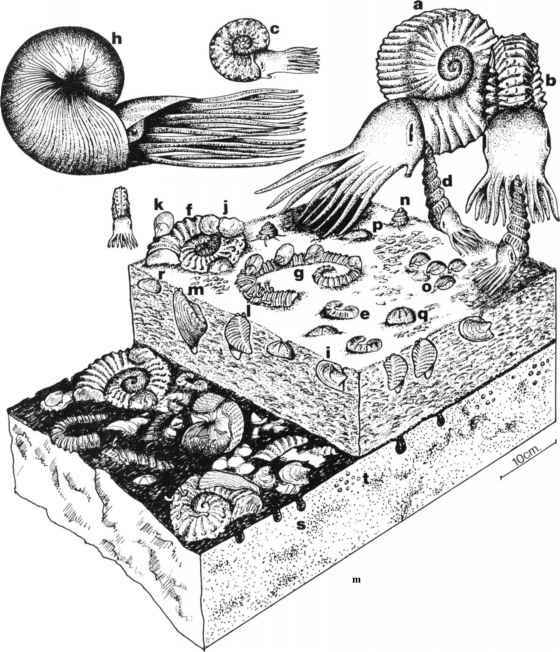 Mantelliceras, with strong, alternately long and short ribs, and tubercles which may be lateral, umbilical, ventrolateral, but never siphonal, is an early member of the super-family Acanthocerataceae which dominate the normally coiled Upper Cretaceous taxa. Early Cenomanian sands with this fauna are exposed in Dorset and Devon. This illustration represents another non-chalk fauna of the Upper Cretaceous which is widespread in south-west England. Here, the base of the chalk commonly rests on a hardground at the top of calcarenites or sandy limestones of Albian-Cenomanian age. The basal few centimetres are a phosphatic conglomerate of pebbles and cobbles, commonly derived from the sandstones and limestones below and accompanied by phosphatized fossils and fossil moulds. These levels are very condensed, and have undergone a complex history of diagenesis and reworking, comparable in some respects to the processes shown by the Gault nodule beds (Fig. 96). Because of this complex history, the faunas are varied and include forms which lived on and in the hardground, epifauna living on the phosphatic nodules, a soft bottom fauna living associated with patches of shell sand which intermittently buried shells and nodules, and diverse nekton. The example shown here is of mid-Cenomanian age. The hardground at the top of the Upper Greensand has been mineralized by glauconite and phosphate, and bear an epifauna of serpulids, ectoprocts, cemented bivalves and other similar organisms; it has been bored by lithodomous bivalves and the sponge Cliona. In places these hardgrounds may also be covered by laminated crusts, now phosphatized, but perhaps originally stromatolitic. The fauna (not shown here) associated with the soft bottoms produced by sand and carbonate mud which temporarily buried the hardground includes diverse bivalves, such as trigoniids, arcids and many heterodonts, and arthropods, diverse echinoids and poly-chaetes. The nekton includes both ammonites and nautiloids; examples of heteromorph ammonites are the helically coiled Turrilites and the loosely coiled Scaphites and Stomohamites. Normally coiled forms are the keeled, ribbed and tuberculate Schloenbachia, which commonly forms over 90 per cent of Boreal Cenomanian ammonite faunas, and two acanthoceratids, Acan-thoceras and Calycoceras, which differ from the Lower Ceno-manian Mantelliceras in the presence of siphonal tubercles. 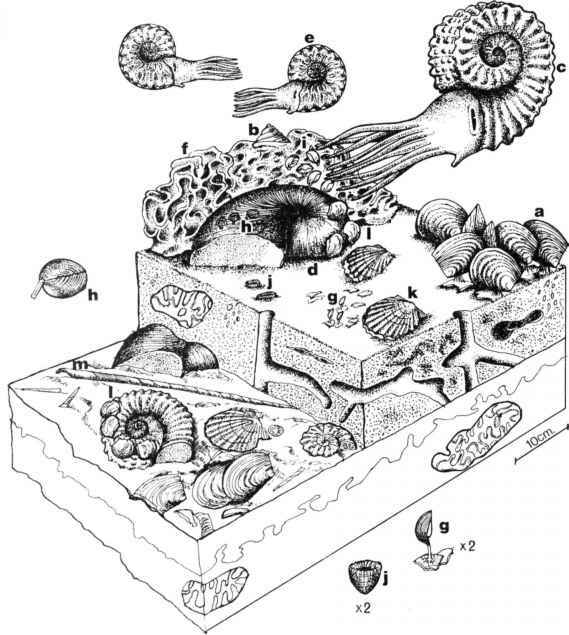 Nautiloids are represented by the ribbed genus Cymatoceras; smooth genera, closer to present-day forms of Nautilus, also occur. The remains of all these groups were filled with sediment, phosphatized and broken. 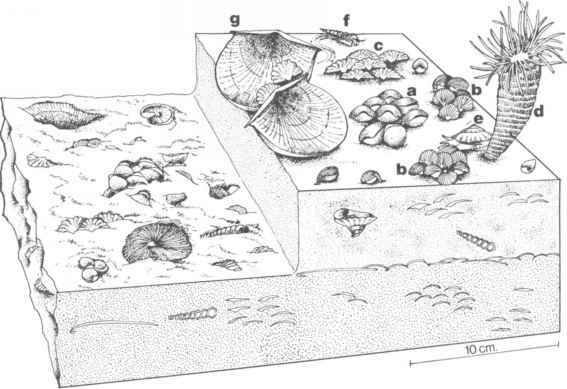 Diverse epizoans lived on this hard conglomerate substrate, including terebratulid brachiopods, serpu-lids and oysters, bryozoans, sponges and other similar fauna; Pleurotomaria and other gastropods almost certainly grazed on algae (not shown in the illustration). The community is present in Britain in south Devon, Dorset and southern Somerset. This fauna is based on that found in the middle part of the Lower Chalk of the Kent coast, at a horizon in the Middle Cenomanian a little older than the basement bed shown in the previous figure. The nekton includes similar ammonites and the nautiloid Cym-atoceras. The straight ammonite Sciponoceras, is locally abundant at this level. 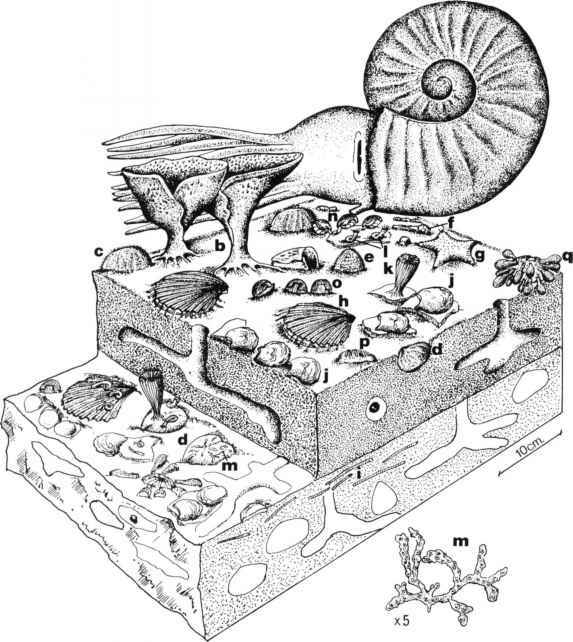 By contrast, the benthos was very different from the condensed fauna; it suggests that the Chalk bottom was a soft ooze. There are large masses of siliceous hexactinellid sponges (Plocoscyphia), which served as a substrate for brachiopods and as food for pleurotomariid gastropods, whilst ahermatypic solitary corals (Micrabacia) lie loose in the sediment, as do large, thin-shelled pectinids such as Chlamys (Aequipecten) beaveri. Terebratulid brachiopods have branched, root-like pedicles, and can live on soft bottoms, attached to shell debris, foraminifera and other material, whilst the large, concentrically ribbed Inoceramus crippsi may have lived in a similar fashion, in dense clumps attached by byssal threads. All hard substrates were potential habitats for encrusting organisms, and many shells are covered by bryozoans, serpulids, bivalves (such as the Pycnodonte illustrated), and may be bored by clionid sponges or other organisms. Only some infauna is preserved fossil, but bioturbation is very marked, with Thalassinoides, Chondrites and Planolites prominent. Water depths were probably too great, and therefore light intensities too low, for the development of algal thickets. This community occurs in Britain in the Weald, the Hampshire Basin, the Chilterns and Cambridgeshire. This illustration is based on material found at a level low in the Middle Chalk on the Kent coast. At this level, the clay content of the chalk is very low; it consists of layers of soft, very bioturbated chalks grading up into chalks crowded with early diagenetic nodules and frequently capped by an erosion surface containing reworked nodules (sometimes bored and encrusted) and shell debris. Aragonitic fossils are rare, and all but the largest shells have probably been dissolved. Two large ammonites are shown, the oval-whorled Lewesiceras, and the coarsely ribbed and tuberculate Mammites. The benthos is dominated by the semi-infaunal, byssate inoceramid Mytiloides which lived in crowded shell beds, and after death contributed substantial amounts of prismatic calcite shell layer to the sediment thus frequently building inoceramid "pavements". These and other shells formed substrates for various cemented organisms such as oysters, bryozoans and serpulids, and some brachiopods may also have attached themselves, as the rhynchonellid Orbirhynchia shown here. The diminutive Terebrat-ulina probably lived rooted to shell debris by its tufted pedicle. 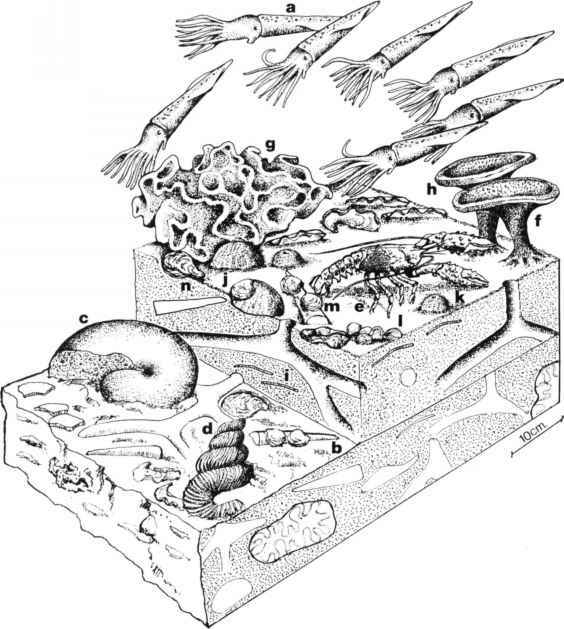 The benthos also includes the ubiquitous siliceous hexactinellid sponges, echinoids, notably regular, epifaunal grazing forms such as Glyphocyphus, and the epifaunal or semi-infaunal ploughing deposit feeder Discoides. Starfish are usually represented by their scattered ossicles; a specimen of the genus Calliderma is shown here. Faunas of this type occur in the Middle Chalk of Britain from south Devon to Kent and north through the Salisbury Plain, Berkshire Downs and Cotswolds to the Lincolnshire and Yorkshire Wolds. The Chalk Rock is a spectacular complex of glauconitized and phosphatized hardgrounds which form a prominent rock band at the base of the English Upper Chalk over much of central England. Unlike most other faunas of the English Upper Chalk, lithification took place before the aragonite in the shells dissolved, and the fossilized assemblage closely resembles that of the living animals as it would have appeared at that time. 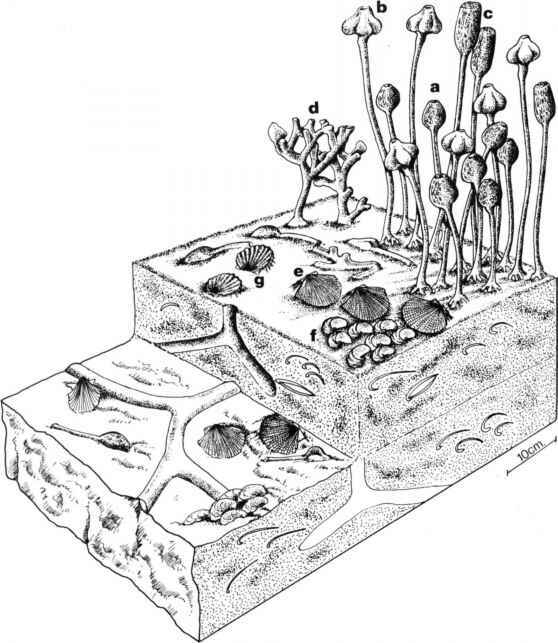 Interpretation of the fauna is complicated, however, by the fact that both hard and soft bottoms (the latter are deposits of chalk ooze in the irregular surface of the hardground) coexisted, and the faunas are mixed. Furthermore, sedimentological and petrographical evidence (Kennedy and Garrison, 1975) suggest that the Chalk Rock formed at relatively shallow depths, and that algal thickets were probably present. The Chalk Rock thus yields diverse and sometimes rich faunas. Organisms associated with the rocky bottom of the hardground surface include boring animals, such as the bivalve Martesia, the sponge Cliona and polychaetes; there is also extensive evidence of the presence of boring thallophytes (algae and fungi). Cemented to surfaces are bivalves,.serpulids, bryozoans,ahermatypic corals, and sometimes crinoids and sponges, whilst a byssate, attached fauna includes bivalves such as Modiolus and Inoceramus costellatus. 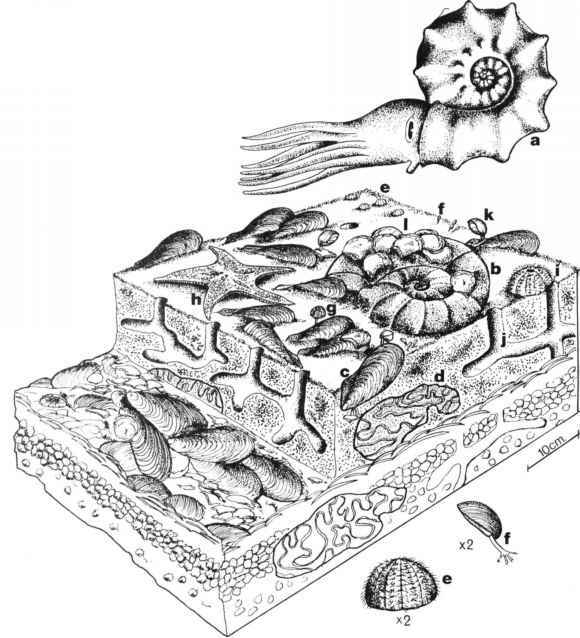 The pockets of soft sediment were inhabited by tiny bivalves including Cardium, Nuculana and arcids, and semi-infaunal ploughing echinoids like the holasteroid Sternotaxis. Gastropods are sometimes abundant at this level, and those present include sponge-grazing pleurotomariids and various trochids (Trochus and Turbo) which were probably algal feeders. The nekton consists of diverse fish and many cephalopods, including nautiloids, and several genera of ammonites; the latter include normally coiled forms such as Suprionocyclus and Lewes-iceras, and loosely coiled heteromorphs such as Scaphites, Hyphan-toceras, Bostrychoceras and Allocrioceras. This community is found in Britain from Berkshire to south Norfolk, and in the northern Weald. The reconstruction of this fauna assemblage is based on a highly fossiliferous soft Santonian chalk on the Kent coast. Faunas of this general composition occur throughout much of the English Upper Chalk, but elsewhere faunal densities are very much lower. Benthic elements frequently adapted themselves for living on soft bottoms: they sometimes developed long spines to spread the weight of the shell, as in the case of the pectinid Spondylus, or club-shaped spines, as with the cidarid echinoid Tylocidaris. Inoceramids are scarce; when present they have often developed a bowl-like lower valve, or are vastly expanded and flattened. Shell debris provided hard substrates which were heavily encrusted by bryozoans, serpulids and oysters; they may also have provided a substrate for some brachiopods. Other brachiopods such as Cretirhynchia, lay loose on the sediment surface when adult. Echinoderms are a prominent element of these faunas and shown here are Micraster, an infaunal or semi-infaunal deposit feeder; Conulus and Echinocorys, which probably lived partly buried, ploughing through sediment and feeding on detritus; the cushion star Mitraster and the crinoid Bourguetierinus. Nekton are represented by the giant ammonite Parapuzosia which reaches a diameter close to 2m, and by teeth of the mollusc-eating fish Pty-chodus, probably responsible for much of the fragmentation of inoceramids and other shells. This fauna occurs in the Upper Chalk of southern England, in Norfolk, Lincolnshire and Yorkshire, and in parts of the White Limestone of Northern Ireland. The highest stage of the Cretaceous, the Maastrichtian, is represented in Britain in limited areas of Northern Ireland, and on the north Norfolk coast. The huge, glacially transported masses found in the latter area are the basis for the illustration. The nekton is dominated by belemnites, a group common only in the late Campanian stage of Britain, although well known throughout the whole of Upper Cretaceous of more northerly areas of Europe. 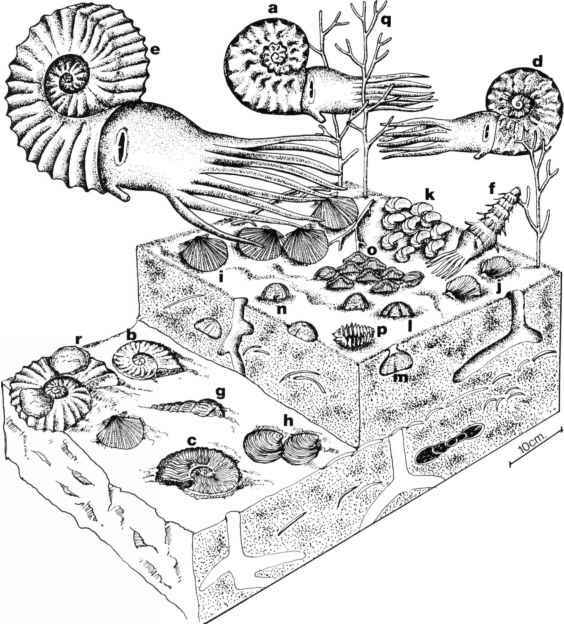 The heteromorph ammonite Bostrychoceras and the nautiloid Hercoglossa also occur. The benthos is similar to that of other soft bottom chalk faunas already described, with masses of hexactinellid and other sponges, bivalves adapted to soft substrates, for instance the plicate 'Ostrea' lunata, the free-living rhynchonellid Cretirhynchia, vagrant arthropods, and echinoids such as Echinocorys and Galerites. Hard substrates such as shells and belemnite guards are heavily bored, and encrusted by oysters (Pycnodonte), serpulids and bryozoa. The sediment is intensively burrowed, with a typical Chondrites, Planolites and Thalassinoides association. This fauna is seen in Britain on the coasts of north Norfolk and Northern Ireland. Only the lower parts of the Maastrichtian occurs on mainland Britain. Chalks and limestones with faunas rather similar to those described here with regard to Britain extend into the late Maastri-chtian in Denmark, Belgium and Holland. These areas show facies changes progressing up the section of a kind that suggest a shallowing of water, associated with an overall marine regression. Bryozoan bioherms, calcarenites and carbonate shoal facies are also widespread in northern Europe, whilst the Maastrichtian/ Palaeocene boundary is everywhere a non-sequence. In the North Sea Basin, chalks and chalky limestones continued to be deposited during the early Tertiary, and this is also true in parts of Scandinavia, but these Palaeocene chalks and chalky limestones contain different faunas from those of the Cretaceous. Ammonites, bel-emnites, marine saurians and many groups of bivalves, echinoderms and foraminiferida have disappeared, and the faunas take on a distinctive Tertiary aspect.